With the busy schedule, we all have, I often do not have much time to do an extensive research online to buy a present, so I look for pre-compiled lists to give me an idea of what to give to the person in question. Be it Christmas, birthday, anniversary or whatever other holiday or celebration, a good gift should be something useful or unique which will not be sitting in the back of the closet for the rest of its days and should cause a visibly positive reaction on the person's face. 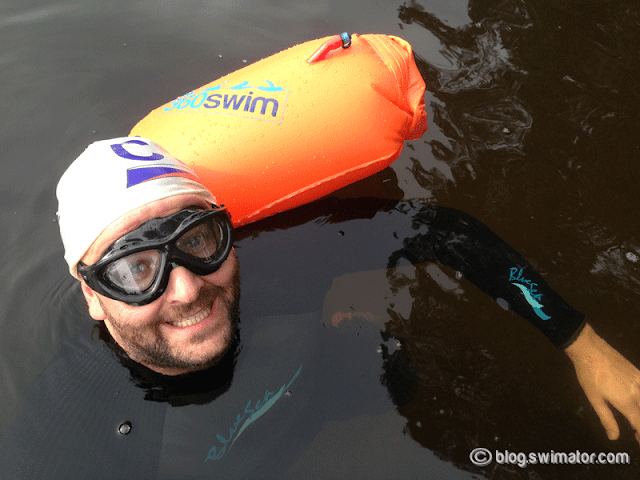 This being a swimming blog, I've put together a list of some ideas for anybody trying to improve their swimming. So, if you have someone in your life who deserves a gift from you and is an avid open water swimmer, just a beginner trying to make a dent into a swimming career, a wannabe triathlete with his/her mind set on the next Ironman competition, or simply someone who loves to swim, this list of swimming gift ideas is for you. 1) Exer-Genie - this is a great compact little gadget which let's you have a full body workout wherever you are. 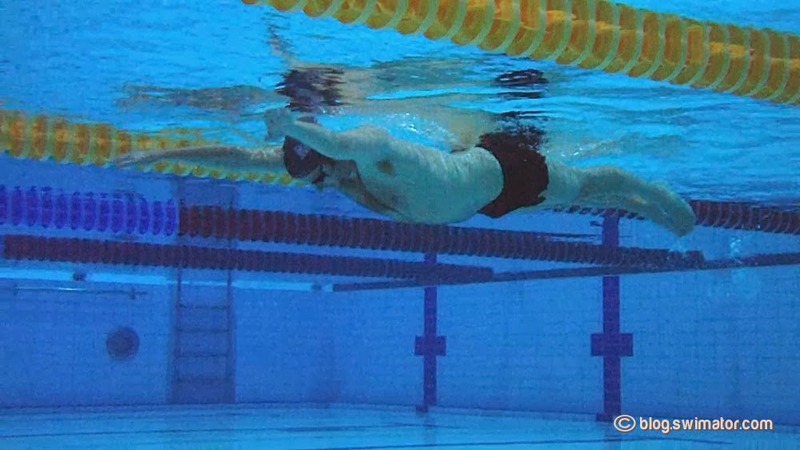 More importantly though, in terms of swimming, it is very useful for practicing your high elbow catch (early vertical forearm) without the hassle of worrying about other aspects of your stroke. It works in a similar way like stretch cords, with the difference that you can maintain a constant tension and you can practice the actual freestyle stroke pattern one arm at a time. In my opinion, every serious swimmer or a triathlete should have one of these and incorporate them into their workouts and off-season training. Exer-Genie falls into the very practical and useful category as far as gifts go. 2) ShinFin Leg fins - these fins have been on the market for a while and I have mentioned them before in one of my Christmas swimming gadget ideas posts, but they don't get the press they should, so here I go again, trying to make a case. If you struggle with learning the proper flutter (freestyle) kicking technique, by wearing these fins, I guarantee you that you will grasp the concept and change your technique in just a few sessions. I've used them on many occasion with beginner swimmers and the results were just astonishing. After one or two lessons, the kicking propulsion improved drastically and most of them are able to kick out of the hip rather than the knee. I just love it when products just work :). With this gift, you are definitely going to relieve some frustration and stress for the person who will use them. 3) Corsuit - having a strong core is a must for a successful swimming advancement. 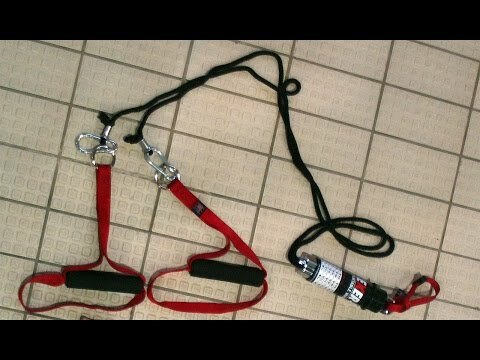 Why not have a little help with this swim gadget. The Corsuit serves as a sort of a casket for your midsection. 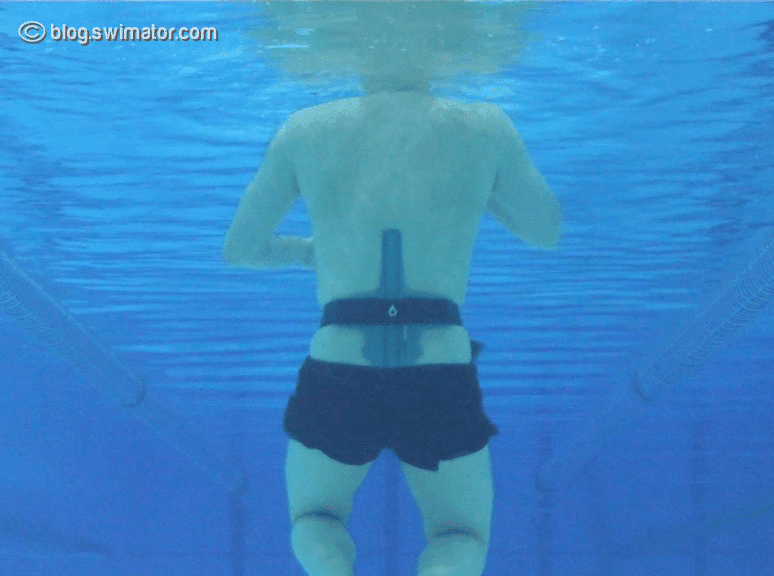 It gives you a constant real-time feedback on your body posture in the water and helps you, for example, maintain a flatter back, so your streamline is as smooth as it can be. The Corsuit will be one of those gifts which will cause a bit of a stir as it is quite unique and not very well known on the market. 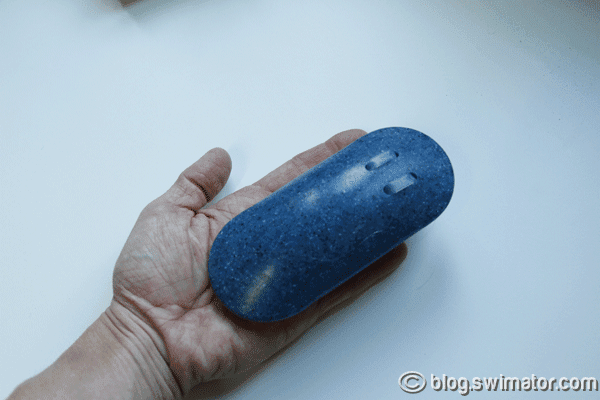 4) Palm Paddles - are probably the world's smallest paddles, but also one of the most useful. Their contour desensitizes your palm, so you do not grab so much water and are more focused on using your forearm, therefore making the front quadrant of your stroke much more effective. Palm Paddles would make a very useful, but also a cute little gift :). 5) Aquaviz mask - this multipurpose prescription lens is so universal, you can use the same lens in your swimming goggles, skiing or snowboarding mask, sunglasses, paintball mask, snowmobile mask etc. etc. You name it and you can use it for it. If you are not into wearing contacts or don't want to buy expensive custom prescription mask/goggles/glasses for every single sports activity you do, Aquaviz is for you. So, go out there and find out the prescription values of your loved one and get them an Aquaviz, so they can see clearly wherever they go. 6) Pebble Smartwatch - with its smart capabilities, you will no longer have to connect your watch to a computer to upload your swim data, it does it by itself through syncing with your Android phone on your way home from the pool. So by the time you get to your cosy destination to sit on the sofa and to check your stats, they are already there. With already ready integration to many exercise platforms such as this Swimming training and workout service from Swim.com, it makes it a perfect gift for any avid swimmer. The modern gift for a modern swimmer. 7) Xmetrics computer - if you want to go a one step further, Xmetrics is the device of the future. The device has a new take on what a swimming computer should be like. It can provide an audio feedback in real-time. Apart from the usual stats, it can, for example, tell you how fast your turns are and I am sure that is just the beginning. If you ever wanted to give a cutting-edge technology gift, this is it. Let's start the "swimming without a watch" revolution together. 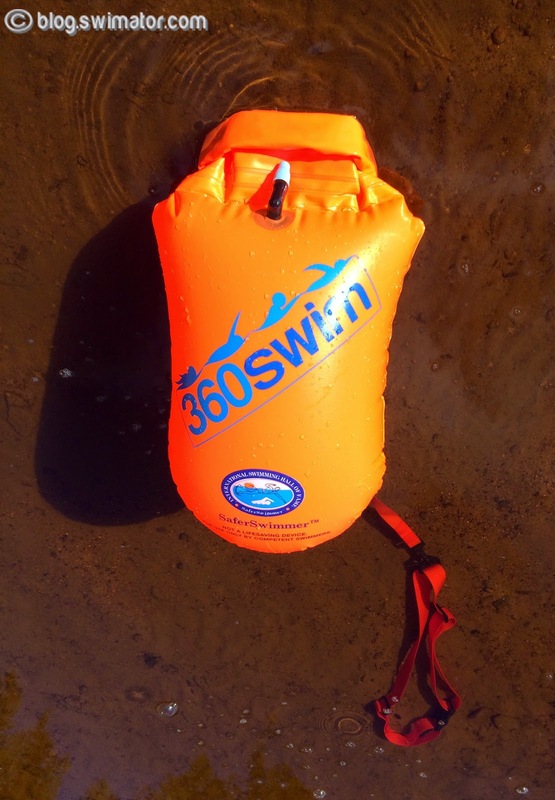 8) 360swim SaferSwimmer - I love this product because it has all the things that a good product should have. 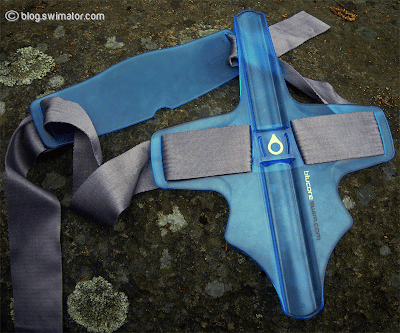 Quality and thoughtful design, it is useful and practical, well priced and it helps people stay safer in the open water. If the person you are buying a gift for swims in open water (be it a lake, sea, pond), with this gift you show them you care about their safety, but you also are thoughtful enough to get them something that they will actually use. You might just save a life with this gift or open new horizons or someone who is afraid to go the open water swimming route on their own. Alright, there you have my list of the gift ideas for your fellow swimmers or triathletes. If you do have some experiences with any of these, please do share them in the comments below, Facebook or on other social channels, so others can also benefit from your experience. Have a great holiday season, Christmas, birthday, anniversary or whatever special occasion you are going to celebrate. And don't forget, keep on swimming :). "All you have to do is swim." That is a promising bold claim made by a technology company with a new swimming wearable gadget soon to be released to the swimming and triathlon communities. This new swimming computer goes under the name of Xmetrics and with its sleek design and a long list of features looks like a very ambitious and useful addition to the swim tech world. Why should you care? Do we really need another swimming tracker wearable and an app to go along with it. Isn't there enough? Actually, there are really not that many good options for improving your swimming when you are after getting some real feedback from the computer and not just counting your laps with your Pebble watch or you don't want to wear ankle and hand bracelets. 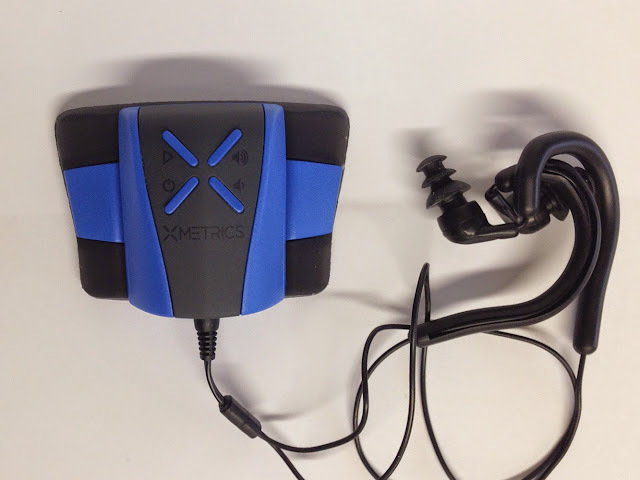 The refreshing part about Xmetrics is that it is not a watch and is able to provide real-time audio feedback while you swim (not even your coach can do that). Like the recently hyped Instabeat it attaches on your goggles, but it hopes to give you much more feedback in terms of your swimming. And if you ask me, in a much better form via headphones rather than your eye. Even though, bone conduction would be even better. 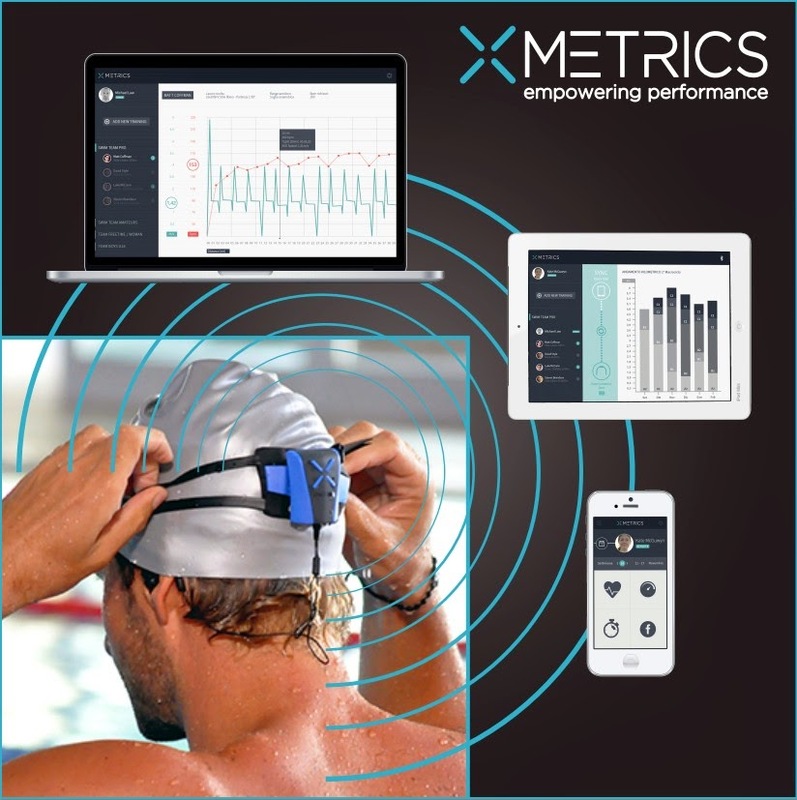 The world seems to be crazy about wearable bracelets and computer watches to measure all aspects of every day lives and exercises, but for swimming this is just not the right way to go, so I believe Xmetrics is onto something. Imagine how many strokes you take in a month or a year. If you swim frequently, it will be in 100s of thousands. Now, add a watch to your hand and only keep it on one of them without switching sides. Is swimming still a sport which works both sides of your body the same? The shoulder might suddenly not feel so good, especially if you have a flawed stroke to begin with. If you are a runner or a cyclist, would you weigh one shoe or paddle more than the other? Doubtful. The metrics the standard swimming watches provide make swimmers focus on the wrong data at the wrong time when it comes to efficiency improvements. When you come home to review the historical data, you will hardly remember what has happened during the swim workout and even if you have a good memory, you are less likely to fix the problem as you will not know if you are doing it correctly the next time around. Finally, who still wears a watch in this century. In my opinion, the wearable wristbands are just a quick over-marketed transition before something that will be a more permanent part of you. 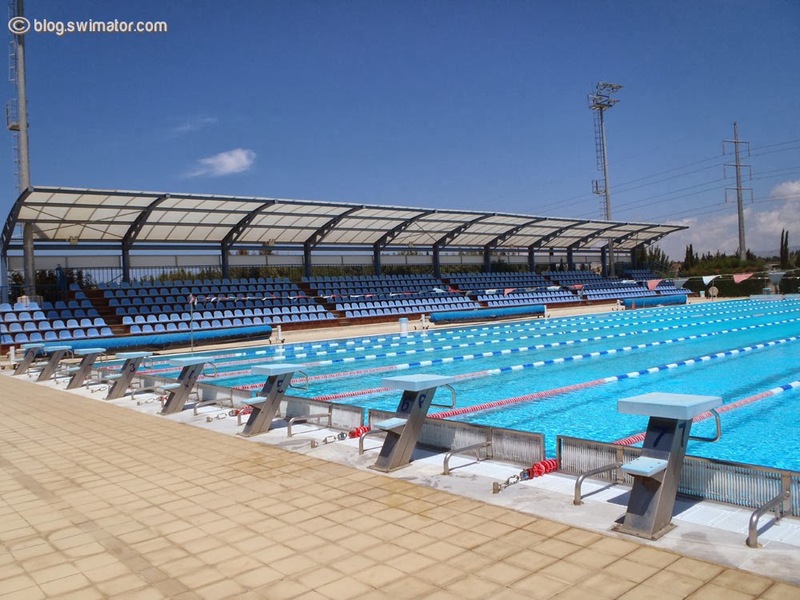 how many laps I have swam - this is a totally useless metric - focus on quality and not the quantity of what you do, so when you find yourself bragging I swam 30K this month, stop and think what that actually means. It tells everyone, you have no clue what you are doing and are competing with the wrong data. how fast I swim and what is my pace - sure this one is a classic and you can't do it without it, so start learning to read the pace clock around your swimming wall or get yourself your very own simple PaceWatch. what is my heart rate - this metric has its place, but many swimmers do not use it the right way (for example: it should also be used during recovery purposes to get your heart rate down back to normal level before starting a new set, especially if you are not such a good swimmer). Many triathletes try to monitor their heart rates in the same way they do in running or cycling (just keep it in the greenzone). The problem here is that more than likely you get enough of this type of exercise on the road while you bike or cycle and should focus on your technique instead of where you heart rate is. Of course, the more experienced swimmer you are, the more heart rate monitoring can help you judge how you are doing. drill logging - how is this helpful, except maybe making sure you at least do some drills in your workouts and can eliminate drill from your workout pace times? I think they just came up with this one to have some more stats to track. If the metric would be how efficient your drills are, then you have a golden ticket. I'd really like to know what a swimmer does with this information. breathing pattern measure - that's an interesting one, but only if it slaps you on the head when you breathe only to one side and breathe in and out of the walls. Now to the features of Xmetrics. The Italian creators claim that it is able to give you real-time audio feedback not only on biomechanical data such as the usual stroke count, number of laps, efficiency, metronome stroke frequency etc. but also biological data like heart rate or blood oxygen saturation. It is also able to tell you your turn speed or your acceleration power in real-time, so imagine how huge of a motivator that could be for trying to focus on improving that turn speed or your catch. There is really no excuse not to improve with Xmetrics. The device should be also individually programmable, so you can adjust what you want to hear from your virtual swim coach. Looks like something from the future. Wait.. IT IS :). 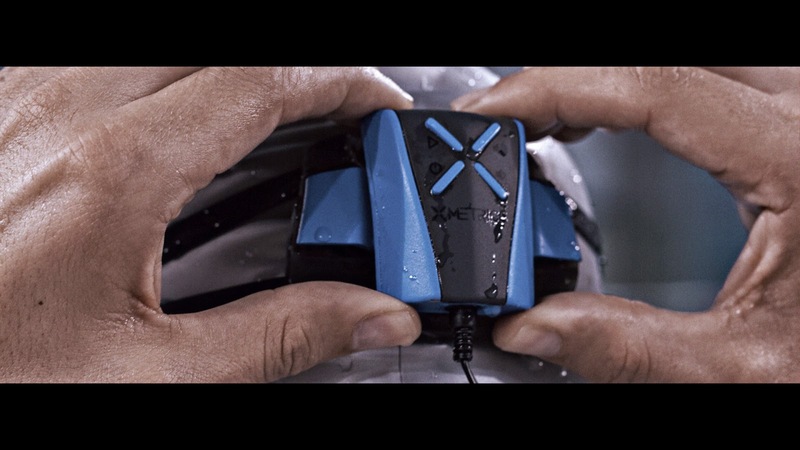 So, bottom line is, if you are into sport wearable gadgets and would like to improve parts of your swimming, Xmetrics might just be the swim computer for you to keep an eye out for and to consider donating to their Indiegogo campaign. Just with the real-time feedback itself, my guess is you will spend a lot less time chasing that historical data during your sleepless nights and maybe spend a bit more time with your kids. I guess, we'll have to wait and see if the guys at Xmetrics can deliver on their promise. I hope they do as I will be lining up to get one for a review as soon as I can. We are still waiting for Instabeat Robocop goggle attachment to hit the market :(. 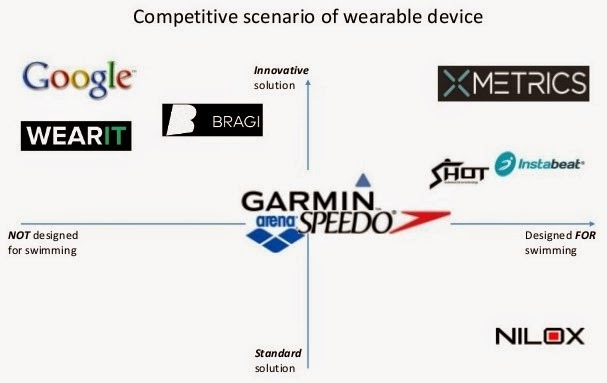 Lastly, some food for thought, what would be very cool is to create sort of a hive of Xmetrics devices inside the pool and have them share the metrics with each other in real-time, so you can for example have a competition with your fellow lap swimmers on who can make the fastest turn or lap etc. How much fun would that be? Welcome to a truly digitized social swimming world. It is a well known fact that every superhero has to have a special suit, a cape or a mask to be taken seriously. At the same time he or she has to have a certain set of extraordinary skills which often are enhanced by their attire. Think Batman and his winged cape or his belt which never ceases to produce a McGyver like gadget to help him escape from a peculiar situation. What does this all have to do with the sport of swimming though? Well, what if I were to tell you that you can also have your own superhero gadget which will improve your special swimming skills that you probably didn’t even know you had. Meet the amazing "BluCore Corsuit". 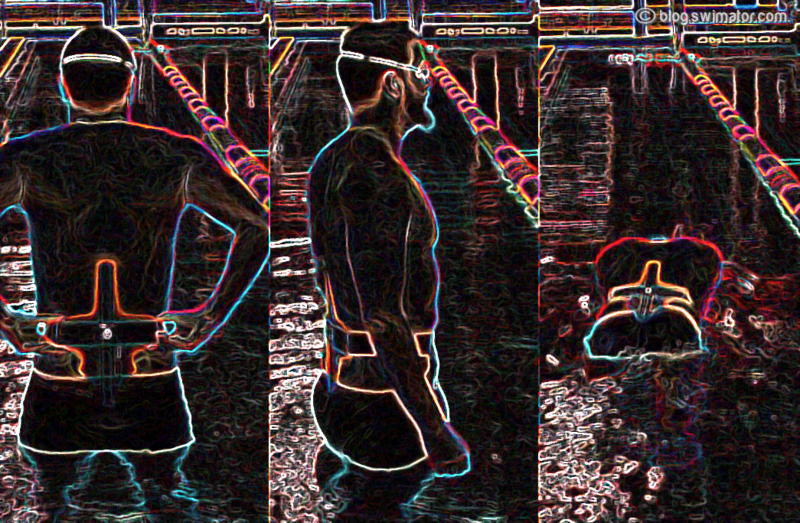 When you put it on, you will be able to improve your swimming body position and reduce your drag which in turn will make you a faster swimmer with lesser effort. Doesn’t that sound wonderful? Before I dive into this mysterious superhero swimming costume, let’s talk about what it takes to learn to swim. Learning to swim can be broken down into 5 high level parts. Of course, swimming by itself composes of a series of very complex and highly coordinated movements in an environment that humans weren’t meant to be in, so there is much more to it then the list of five I mention below. However, on the way to some sort of swimming ability these basic principles apply. First, before you attempt anything remotely resembling swimming, you will have to learn to be comfortable in the water. Many of us learn this when we are young, so we usually skip this phase during our adult age and take it for granted. Second, you should learn how your body balances and behaves in the water in different positions at the same time you learn to kick, so you can actually go somewhere. Third, you need to learn how to breathe, so your journey is not limited by your ability to hold your breath and you can fully learn how to relax in the water. The breathing step is really accompanying all the steps, but wanted to listed here as it is equally important. Fourth, you will discover how to use your arms as propellers and fifth, the most complicated part is to put it all together. One common theme in all of those phases (maybe not the first one) is the ability to hold your body in a buoyant horizontal position and this is where your superhero corsuit comes into play. 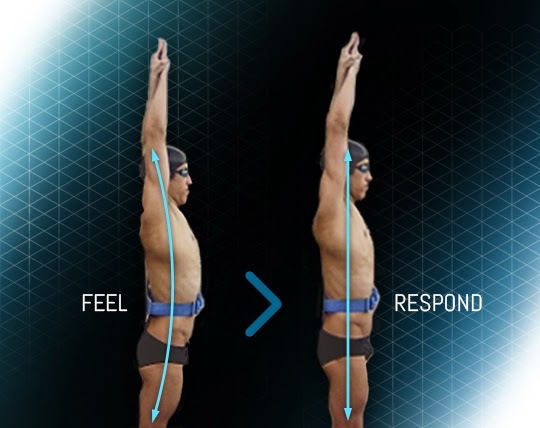 In simple terms it allows you to get an instant feedback on your posture and alignment while you perform one exercise from the never ending list of swimming drills. 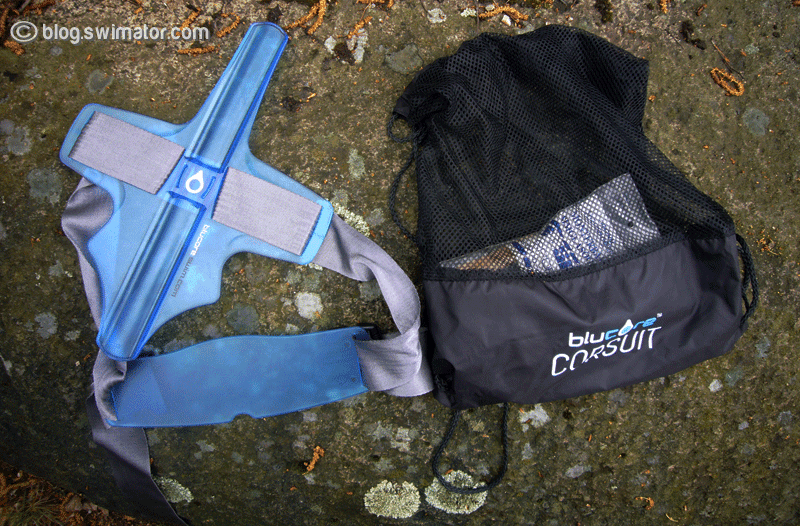 Who should use the corsuit and how does it work? If you suffer from sinking legs, the corsuit allows you to have a tangible surface to press your lower back against to help with leveling you out. 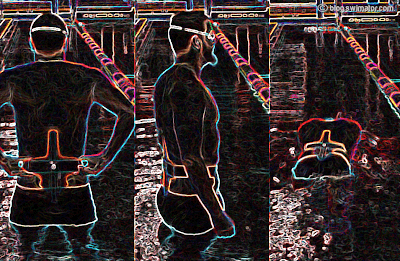 If you swim like a snake from side to side, the long axis of the corsuit will give you a sensory feeling on your spine that you are not swimming straight. If you train for short sprint events, you can use the corsuit for getting a constant feedback about your hip position, so you can keep them nice and flat and eliminate your kick loosing power to the sides. If you swim butterfly over the water instead of through the water, in other words, you come up too high, the top end of the corsuit will give you a bit of a pressure on your spine to help you move your hole body instead of just raising your upper body from the water. If you are into breaststroke, it helps to limit the arc in your back and improves your up and over motion to keep you focused on forward motion with your hips high at the surface. If you swim and are just looking for something new to spice up your workouts, the corsuit is a wonderful tool for that. It keeps you thinking about your body position and it is something different, so all in all a good fun :). How to put it on? All you have to do is slip the suit through your legs onto you mid section of your body with the large cross piece on the back and the flat piece on your stomach. Then snap the buckle, so it is nice and snug and does not move during your swims. On the bottom of the front piece, there is a small half circle shaped opening which should fit exactly where your belly button is, so it serves as a guideline to how high on your back to put it. On the back side, there is a spacious ridge into which your spine will fit, so you don't have to worry about the corsuit hurting your vertebrates. I've been wearing it for the past six months and have to say that have not felt any discomfort at all, so well done to the inventor. I’ve found that if you have a naturally more curved lower back, you can have it lower on your back to help you with the problem, but as long as you have an initial gap between your lower back and the corsuit, you are good to go and can strive to make your back flat against it. My suggestion would be to not spend too much time with the initial fitting of the coresuit, but adjust it as you see fit during your swims. After a while you will discover the position which brings you the most benefit. I swim with the suit a few hundred meters at a time, trying to keep my body nicely aligned, then take it off and attempt to mimic the same feeling that I had while wearing it. Of course, you can keep it on for longer, but I would not recommend it as you do not want to start relying on the suit. It should only serve as a check up tool to make sure you are doing the right thing. Here is a short list of swimming sets you could incorporate into your corsuit training to get the most use out of the tool. Don't be afraid to dive, the corsuit will not hinder you a bit. These are just examples to get you started. Be creative and make your own sets. If you have one in particular that you like, please do share it below in the comments, so others can also benefit from it. In addition to swimming workout routines, since the corsuit is wore around your waist, it can totally be used in a gym during your core body workouts to keep your posture true even when out of the pool. So in summary, I have to give this product big thumbs up. It is unique in its own way and it tries to address one of the biggest challenges of improving in swimming which is the lack of real-time feedback. 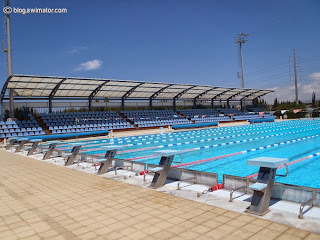 When you have a coach on the pool deck, you get some initial instruction and then you are left alone to execute it, then after a bit you might get more instruction etc. etc. This is a very slow process. If you have a tool with you that is constantly giving you tactile impulses which tell you if you are doing something right or wrong, it is priceless. Of course, I am not insinuating that the corsuit replaces your coach :), but it is a big plus to have the ability to adjust your stroke while you swim. To learn more about the corsuit, check out this user guide which also has some useful drills to practice your body alignment.